A unique collection of 422 small molecule modulators used for Ion Channel and Membrane Transporter research. • Cancer Cell . 2017 Apr 10;31(4):501-515.e8. • Nat Commun . 2016 Sep 15;7:12840. • Clin Cancer Res . 2018 Jan 15;24(2):383-394. • PLoS Biol . 2018 Jul 12;16(7):e2004921. • Haematologica . 2017 Oct;102(10):e415-e418. • EMBO Rep . 2016 Oct;17(10):1422-1430. • Theranostics . 2018 Oct 29;8(19):5452-5468. • Br J Pharmacol . 2018 Dec;175(23):4325-4337. 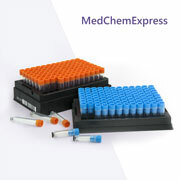 • A unique collection of 422 small molecule modulators used for Ion Channel and Membrane Transporter research. • The library contains compounds targeting Membrane Transporters including Pgp, CRM1, BCRP, etc., and Ion Channels including CFTR, proton pump, sodium pump, calcium pump, etc. • A useful tool for the research of drug absorption and distribution.